Does Your Pet Love You? 7 Ways Your Fur-Babies Show Love For You | Scoop The Poop! Mother cats groom their kittens from the moment they’re born, so being licked was one of your kitty’s very first feelings of being cared for. Sibling kitties who are raised together often groom each other throughout their lives. So if your kitty is licking you, she’s showing her love for you. 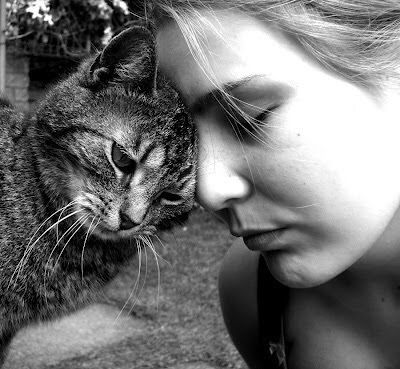 If your cat rubs against your cheek or bumps heads with you, he’s leaving his scent on you. This is called ‘bunting’ and it’s a form of feline affection. Bunting is reserved for a cat’s most favorite creatures – including the human he considers his own! Cat eyes are quite large. In fact, if your eyes were proportionately as large as your cat’s, they’d stretch all the way across your face! If your kitty puts his face close to yours and stares with huge, wide open eyes at you, then blinks slowly he’s showing you how much he loves and trusts you.